Hou, R., Xu, X. and Ouyang, Z. 2018. 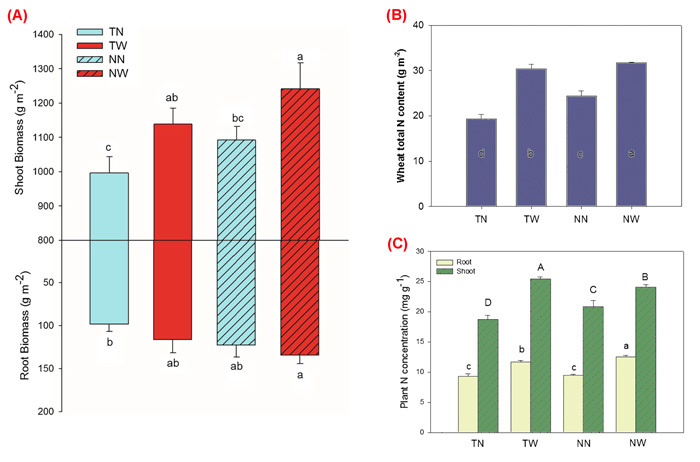 Effect of experimental warming on nitrogen uptake by winter wheat under conventional tillage versus no-till systems. Soil & Tillage Research 180: 116-125. The efficiency of crop nutrient uptake is one of the key determinants of crop growth and yield. Thus, enhancing crop nutrient acquisition has long been an important goal of agronomists in their efforts to increase crop yields per unit of nutrients applied in order to meet the growing food demands of the planet's rising population. And in this regard, it is important to study how crop nutrient uptake may be altered according to future projections of climate change, in particular, rising temperatures. And that is exactly what Hou et al. (2018) set out to do in a recent paper published in the journal Soil & Tillage Research. According to the three Chinese researchers who conducted the study, despite "the perceived importance of nitrogen (N) to growth and production of wheat, few studies have attempted to examine the effect of warming on wheat N uptake or its preference for NO3--N vs. NH4+-N, especially under different tillage systems." And so it was that the scientists studied this topic on a wheat farm in the North China Plain. Warming differences (+2 °C increases in soil temperatures) were accomplished using infrared heaters and subplots of different N sources (three forms, including NO3-, NH4+ and glycine-N) that were established under conventional and no-till management systems. The results of the analysis revealed, in the words of the authors, that "warming strongly enhanced wheat biomass (14.7% and 13.2% for till and no-till, respectively) and N content in biomass (11.1 and 7.4 g N m-2 for till and no-till, respectively)," such that "total N uptake rates rose by 47% and 40% in the till and no-till treatments." Hou et al. also report that warming "changed the uptake pattern for the three N forms by significantly increasing the contributions of NO3--N by 16% and glycine-derived N by 5%, while decreasing the contribution of NH4+-N by 20% under the two tillage systems, on average," which change in N-uptake percentages they say could potentially result in a reduction of N loss via leaching or emission, thereby helping to decrease inorganic N input into croplands. Collectively, the above findings indicate significant benefits of future warming on winter wheat, including increased N uptake, content and concentration, which increases helped to improve both the quantity and quality of the wheat crop. And that is a future worth experiencing! Figure 1. Panel (a), root and shoot biomass under the four treatments (TN, till with no warming; TW, till with warming; NN, no-till with no warming; NW, no-till with warming). Panel (b), total N content in roots and shoots under the four treatments. Panel (c) root and shoot N concentrations by treatment. Different upper and lowercase letters indicate significant difference among four treatments (one-way ANOVA, p < 0.05). Adapted from Hou et al. (2018).